Finally, a reason to play an old FIFA game. In Why I Love, PC Gamer writers pick an aspect of PC gaming that they love and write about why it's brilliant. Today, Tom chats about last year's FIFA and its story mode. When FIFA 17’s story mode was announced, the response was mostly mockery. Will there be Renegade and Paragon options for post-match interviews? (Yes). Will it end with a 'suicide match' consisting of all the characters you've met so far? (Sadly, no). Yet when I actually gave it a try it ended up being one of the most unusual and innovative stories I’ve ever played. 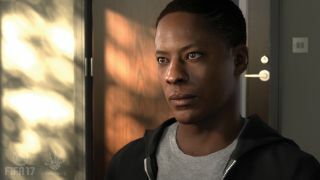 Let’s set the tone: the game begins with you, Alex Hunter, as a ten-year-old boy playing football in the park. After winning or losing the match, Alex goes back to his tiny, pokey terraced house and distracts himself playing keepie ups while his parents argue downstairs. This is not the kind of scene I’ve ever encountered in a videogame before. It’s more akin to Eastenders than Mass Effect. There’s a reason for this: the story is set across a full season of Premier League football and Alex can sign for any team in the division. Because of this, there’s no way FIFA can tell a traditional underdog sports story, after all I might be playing for an awful team and lose a lot. Instead, they’re forced to make a story about human drama. Mostly about Alex’s relationship with his best friend Gareth. They both sign for the same team (whichever one you choose), but Gareth is initially more successful, and the fame and media adulation slowly go to his head, leading him to demand a transfer (and also subtweet Alex on the in-game Twitter). Gareth isn't the only NPC injected into a real football roster, there’s also two veterans, Gallo and Bernard, who mentor you in whatever team you sign up for. Then there's Danny, a fellow youngster playing for whichever lower league team Alex gets loaned out to. When you first encounter him at your tryout session he's a swaggering prick who is convinced he's headed for the big time. He pops up again once Alex gets loaned out, but not making it to the top level has humbled Danny, and he slowly comes to replace the distant Gareth as Alex’s new closest friend. He's still self aggrandising, but now it feels like a joke you're in on, rather than a one-dimensional cocksure swagger. It's not easy to create a likeable character with these traits, and yet somehow Danny became a personal favourite of mine. At other times the cracks in the real-world/fiction artifice begin to show. Since none of FIFA's recreations of real-life football managers are voiced, you only ever talk to their assistant, while a silent Arsene Wenger looks on approvingly in the background. At a certain point in the plot your team will make a big money transfer for a player in your position, which can result in the bizarre spectacle of James Rodriguez moving from Real Madrid over to Middlesbrough. There’s also little nuggets of procedural narrative lurking around. When I was near the top of the table, players suddenly started talking about a title challenge. Picking a team that had qualified for the Champions League got me a talk from the Assistant Manager about how different European football is. If I’d done poorly, would that story have instead pivoted to a desperate relegation battle? I was lucky, my season ended in the most perfect possible way, with Alex playing in the final of the FA Cup against Gareth. This finale is semi-planned, Gareth’s team will always make it through to the final, and Alex doesn't play in the first few rounds, ensuring his team can progress. Yet there was still the very real possibility I could’ve lost the whole thing, ruining the fairytale. Next year’s FIFA is confirmed to carry on Alex's story, and I can only hope they continue this weird experiment. Perhaps they could lean even more on the fictional side, I would honestly be happy if Alex played for a fictional team staffed entirely by NPCs. Yet regardless of which direction they go in, it's worth going back to FIFA 17 and sampling Alex's first story. Yes, for the first time ever, an out-of-date FIFA game is actually worth buying. This was written shortly before the release of FIFA 18, and originally published in PC Gamer 310—hence the conclusion of this piece. Find out what Tom thought of the new Journey mode in his review.